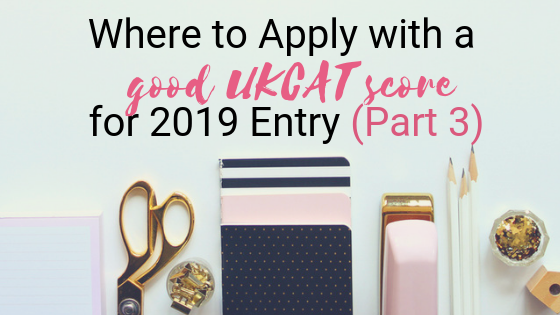 If you’re applying from 2020 entry and beyond, you will sit the UCAT instead of the UKCAT. Learn about the changeover here. In the second part of our Where to Apply with a 650 – 680 UKCAT Score blogs, we look at a range of other medical schools that favour this type of UCAT score. During the first stage at Sheffield, applicants are screened to ensure they meet the medical school’s minimum academic requirements. Applicants also need to achieve an overall UKCAT score of 2470 or greater. All applicants meeting these requirements will advance to the second stage where they are ranked on their UKCAT score. Those with the highest UKCAT will be invited to interview. For 2018 entry the cut off score for interview was 672.5, and for 2017 entry was 667. with Sheffield commenting the cut off points “fell around the 70th-73rd centile”. So, to stand a good chance of an interview, a UKCAT in the top 30% is likely needed, possibly higher. Sheffield also comment that there is no ‘academic compensation’. This means exceeding their minimum academic requirements will not make up for a low UKCAT score. At interview, there will be 8 stations, with the SJT serving as a virtual ‘ninth’ circuit. This means your UKCAT score will not be used at the interview stage, but your SJT will. Your personal statement is not scored. At Glasgow “The UKCAT score together with meeting Academic and Non-Academic Entry Requirements will be used to select applicants for interview”. This means the UKCAT will be used to determine who to invite to interview, but alongside your academics, personal statement and reference. This involves checking applicants meet the minimum academic requirements. The personal statement and reference are “considered thoroughly for non-academic attributes and evidence for suitability to medicine”. Those who pass this screening system will have interviews allocated depending on their UKCAT score. For 2017 entry, the lowest score considered for interview was 663 and for 2016 entry was 670. This means to stand a realistic chance of getting an interview at Glasgow you need to be in about the top 30% of those sitting the UKCAT. The SJT is not used. The first stage of Manchester’s application process is an academic screening, to ensure candidates meet the medical school’s grade requirements. All applicants who pass this will then be ranked on their UKCAT scores in the second stage. A set number of applicants from the top of the ranking will proceed to the interview. For 2018 entry the cut off for interview was 665. For 2017 entry this was 653 for 2016 entry was 665. Manchester comments that “if your UKCAT score is in the approximately the top third of all results nationally then you will be invited to interview based on our UKCAT threshold as long as you meet our minimum academic requirements”. Around 1000 students will receive interviews this way. If you qualify for Widening Participation (WP) then this cut off will be lower. Keep in mind Manchester has introduced a ‘non-academic information form’ (NAI) that will be used instead of the personal statement. Applicants will complete this form after sending off their UCAS form, but they may still look at your personal statement in certain circumstances. Again, Manchester comments that “the Non-Academic Information Form can be thought of as an expanded personal statement where you can provide more information and tell us why you chose to apply to this medical school.” The form can be found here. They do not consider applicants who have scored Band 4 in the SJT. You can find out more information on Manchester’s use of the UKCAT here. Traditionally King’s has sought applicants with a high UKCAT score. UKCAT is used alongside GCSEs, predicted grades, personal statement and reference to select for interview. King’s does comment “examination results and the UKCAT score are perhaps the most important”. Applicants are ranked on their average UKCAT score and SJT band. Following this, King’s then factor in number of A*’s at GCSE, A level predictions and Widening participation. As for the weighting of these factors, “generally, UKCAT score accounts for 50% of the ranking, GCSE and School performance 40% and other widening participation factors 10%”. There is no threshold score at King’s, but in the past they have given ‘guideline scores’. These are scores ‘indicative of what would have been seen as competitive in previous years.’ Getting such a score would not guarantee interview and getting below the score would not guarantee rejection. Guideline scores have varied between 630 and 735 over the last few years, so it is hard to predict what it will be this year. Nevertheless, in most years scores in the top 20% of candidates have been considered competitive. For 2015 entry the median UKCAT score of applicants was 715, and 695 for 2016 entry. If you are scoring below the top 20% of those in the UKCAT, then King’s is certainly still an option. However, you will need a good set of GCSEs and predicted grades to compensate for this. Personal statements are not graded or scored. King’s comment they “are looking particularly for evidence of appropriate commitment to, and realistic appreciation of, the academic, physical and emotional demands of a medicine degree programme and career”. For the SJT, King’s comment they give “higher weighting to those with Band 1 and Band 2. The weighting of Band 1 is double the weighting of Band 2. We do not give higher weighting to those with Band 3 or 4.” This means it is preferable to apply with a Band 1 or 2. Kings determine offers based on average UKCAT score, SJT band and interview performance.